If you're looking for bluegrass and traditional music in the Hawaiian Islands, you've come to the right place. Our little community of music lovers from all over Hawai`i and the rest of the world is growing bigger every day. We're now offering paid memberships for only $10/year! Use your PayPal account or mail a check. Become a member today and support bluegrass and traditional music in the Aloha State! Or add yourself to our mailing list - it's FREE. CLICK HERE. Any changes, corrections, or additions to this site? Please email evelyn@bluegrasshawaii.com and I'll add, modify, or delete right away. Mahalo! Bluegrass in the Ko`olau kicks off FRIDAY, April 26, at Ho`omaluhia Botanical Garden in Kaneohe! 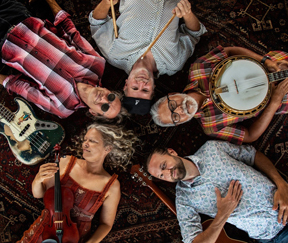 Join us for one, two, three or four days (Friday, Saturday, Sunday, and Monday April 26 - 29), as an acoustic musician, or as somebody who just loves to listen to great homegrown bluegrass and traditional music! Please CLICK HERE for all the information on workshops, schedule, camping registration and park rules! DON'T MISS THESE OTHER COOL EVENTS! Don't miss these OTHER cool recurring events, with focus on traditional music, here and there all over the Hawaiian Islands! Some happen monthly or even quarterly. Others have gatherings several times per month! All are listed on our RECURRING EVENTS page. Second Saturday of each month at Rainbow Park, Makawao, Pickin' with the Chickens! Please contact Larry Hind at larry@divefish.com for information. Your membership helps us support bluegrass through campouts, workshops, jam sessions, and promotion of Hawaii venues to visiting bands. And at just $10.00, it's a bargain! TO JOIN OR RENEW YOUR MEMBERSHIP, please use the PayPal button below to use your credit or debit card, OR mail a check or money order for $10.00 to Bluegrass Hawaii, P.O. Box 861688, Wahiawa, HI 96786.